PHOENIX, AZ - New Mexico State ran its winning streak to five straight in beating Grand Canyon 3-1 in Western Athletic Conference action Thursday night at GCU’s Antelope Gymnasium. NM State (14-5, 4-0) remained unbeaten in WAC play, downing GCU (2-14, 0-4) 25-22, 25-22, 17-25, 25-19, but Aggie head coach Mike Jordan didn’t think his team played all that well. LAS CRUCES, N.M. - New Mexico State started slowly, but came on strong at the end as the Aggies beat Missouri-Kansas City 3-1 on Saturday to remain unbeaten in Western Athletic Conference play. NM State (13-5, 3-0) handed UMKC (9-5, 2-2) the loss 17-25, 25-16, 25-19, 25-17 at the Pan American Center in front of 1,233 fans. The Aggies are alone in the lead of the WAC. The Aggies got 16 kills from senior All-American candidate Gwen Murphy of Elfrida, Ariz./Valley Union. Murphy also hit .600 for the match and tallied six total blocks. LAS CRUCES, N.M. - New Mexico State had a chance to play the roster tonight, as the Aggies had no trouble in downing Chicago State 3-0 in Western Athletic Conference play on Thursday night. NM State (12-5, 2-0) needed only an hour and 14 minutes to dispatch the Cougars (1-15, 0-3) 25-15, 25-17, 25-18 in front of 1,169 at the Pan American Center. But Jordan was quick to point out the Aggies didn’t play well in one area of the game. LAS CRUCES, N.M. - New Mexico State got outstanding play from senior outside hitters Gwen Murphy and Bradley Nash to take the volleyball Battle of I-25 with a 3-1 win over New Mexico Tuesday night at the Pan American Center. NM State (11-5) downed the Lobos (8-7) 20-25, 25-20, 25-14, 25-22 in the closely contested match. LAS CRUCES, N.M. - New Mexico State got a solid performance on the floor Saturday afternoon as the Aggies opened Western Athletic Conference play with a 3-0 victory over the University of Texas Rio Grande Valley. NM State (10-5, 1-0) swept the Vaqueros (7-8, 0-1) 25-18, 25-18, 25-17 at the Pan American Center. The Aggies were led by the powerful play of senior Nathalie Castellanos of Vado, N.M./Gadsden, who tallied 10 kills with a .429 hitting percentage and two blocks. TUCSON, AZ - The New Mexico State Aggies gave the second-ranked Texas all it wanted in the final day of the Wildcat Classic, but the Longhorns held on against the scrappy Aggies to win 3-1 at the McKale Center. NM State (9-5) battled in every set to No. 2 Texas (10-1) before falling 22-25, 27-25, 23-25, 19-25. "It was a tough one," said NM State Head Coach Mike Jordan. "I was happy with the way we played. We had the chance to go up two sets on the No. 2 team in the country." "The difference was they're ability to score running the slide." TUCSON, AZ - The New Mexico State Aggies had no problem on Friday evening at the McKale Center against Savannah State, winning 3-0 in their second match in the Wildcat Classic. NM State (9-4) trounced the winless Tigers (0-14) 25-9, 25-14, 25-13. "We're glad everyone got a chance to play and for the most part, played well," said NM State Head Coach Mike Jordan. "We needed to get that." The Aggies got stellar performances from Arizonans Gwen Murphy and Jordan Abelos. Murphy, a senior from Elfrida, Ariz./Valley Union, collected eight kills, hit .800 for the match and collected five blocks. Abelos, a sophomore from Safford, Ariz., also recorded eight kills to go with 12 digs and five assists. TUCSON, AZ - The New Mexico State Aggies fought another nationally-ranked opponent tooth-and-nail, but the No. 16 Arizona Wildcats held on to take a 3-1 win to open the Wildcat Classic Friday morning at the McHale Center. 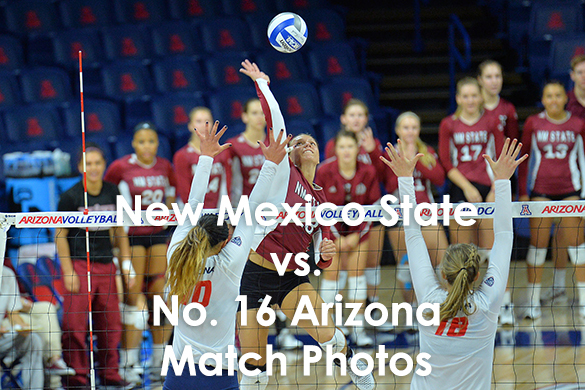 NM State (8-4) fell 15-25, 26-24, 19-25, 23-25 to the home-standing Wildcats (9-1). NM State hit .191 for the match, while Arizona hit .201. Both teams collected double-digit blocks, with the Wildcats posting 13.0 team blocks to the Aggies 11.0. LAS CRUCES, N.M. - Senior middle blocker Gwen Murphy notched a career-high 20 kills to help the Aggies outlast Denver 3-2 on Saturday afternoon. After holding a pair of five point Aggie leads at 12-7 and 19-14, Denver rallied to tie the set at 22. Murphy notched a pair of kills followed by a service ace from Jordan Abalos to give the Aggies the final three points of the set. Denver dominated set two jumping out to an 11-3 lead as the Aggies hit just .025 in the set with nine attack errors in the set.